I love Christmas. It's a time for cheer, merriment and all around goodwill. What I don't love is the waste that comes with it. All that wrapping paper is enough to give me a headache. Not to mention the plastic packaged gifts! And lets not forget the push for mass consumerism, starting with Black Friday. The holidays are indeed wasteful, but I'm happy to say there's so much you can do to cut back on it. I firmly believe the individual has a lot of power to make a difference. You can totally have a (nearly) zero waste Christmas, if you just get a little creative and think outside the box. 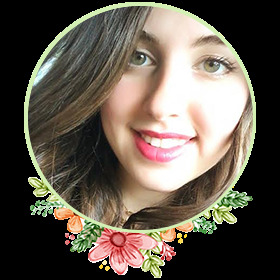 Why should I have a zero waste Christmas? First, lets ask ourselves the big question: Why does it even matter? Why should we go out of our way to reduce trash this holiday season? Well, I'm prepared to answer that question with another question: How wasteful are the holidays? On average, Americans throw away 4.4 pounds of garbage per day (which isn't good, in and of itself), but this amount increases during the holidays. Americans throw away 25 percent more trash during the Thanksgiving to New Year holiday period than any other time of year. Essentially, this extra waste amounts to 25 million tons of garbage (or about 1 million extra tons per week). Isn't that insane? It's certainly enough to make an eco-conscious person like me nuts. The 2.65 billion Christmas cards sold each year in the U.S. could fill a football field 10 stories high. If we each sent one card less, we'd save 50,000 cubic yards of paper. Is your mind blown yet? Mine sure is. As much as I love the holidays, and appreciate the gifts I get, I cannot help but feel we are only digging ourselves a deeper hole. A hole filled with waste. But I try not to let these statistics get to me too much. As alarming as they are, I do my best to use them as motivation. I suggest you do the same! I always say, "be the change you wish to see in the world". Those statistics bother you? Do something to change them! If you're ready to take the next leap, good. I'm here to help. How can I have a zero waste Christmas? If you feel overwhelmed by the waste produced on Christmas, know there's hope. 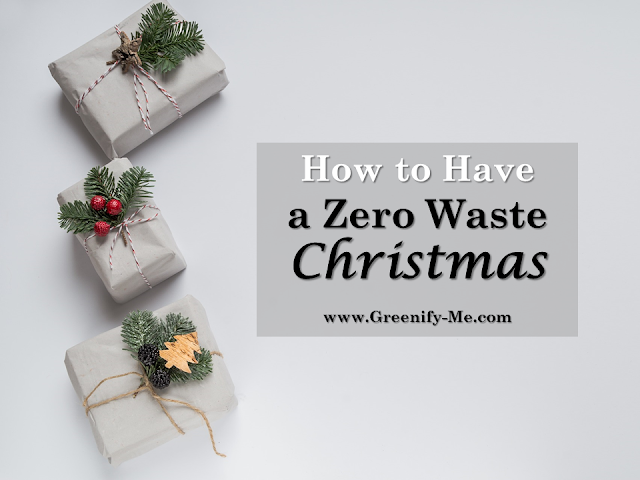 Use it as an opportunity to create your own zero waste Christmas! Even if it's not perfectly waste free, there are so many things you can do to lower the amount of trash created this holiday season. That's why I'm rounding up nine easy ways to green your Christmas. You'll certainly make a positive impact by following these tips and tricks. Wrap things in recycled paper, fabric, newspaper, paper bags, maps, and reusable gift bags. Use twine or jute to create bows and decorate with pine tree sprigs and dried oranges. Your gifts will look super unique! 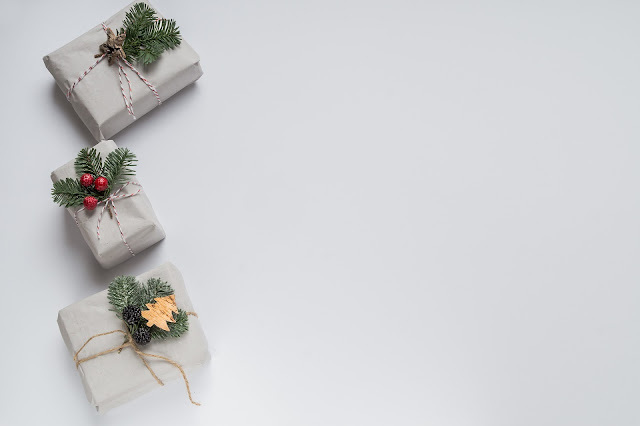 Here are 3 zero waste gift wrapping alternatives I personally recommend. Last year I purchased some vintage lace from a thrift store and used that, along with pine springs and twine, to wrap my boyfriend's gifts. He loved it, and I'm currently reusing the lace to decorate my dining room table with. It's reusable, after all! Instead of giving items that may sit in the closet collecting dust, really look into what someone will enjoy. There are so many different kinds of zero waste Christmas presents you can give: I always say something from the heart is best though. Consider gifting an experience, like wine tasting, a mini getaway, tickets to a play or sports game, etc. You could also make them something homemade like body lotion, bath bombs, consumable goodies, etc. Or, you can buy them something reusable, like a reusable water bottle, cozy blanket, cute tote bag, etc. Essentially, try to avoid making or buying something that is packaged in plastic. No waste Christmas presents are the best, after all! Think long term, not short term. If you need more eco-friendly gift ideas, here's a zero waste gift guide that will help you out. If you do decide to send holiday cards, look for ones made from recycled paper. Avoid cards with glossy, shiny, glittery or gold foil coatings since these cannot be recycled. You can also make your own (or buy) cards made from seed paper. Botanical PaperWorks sells some really cute seed paper Christmas cards. Or, you could always send electronic cards, make a phone call, or just skip the holiday cards entirely. Real Christmas trees are actually better for the environment than fake trees. Fake ones are usually made from PVC which is bad for your health and the environment. They cannot be recycled, and in order for fake trees to even be remotely sustainable, you'd need to use one anywhere from 9 to 20 years. Real Christmas trees are much better for the environment, provided you pick one up locally and recycle/compost/mulch it afterwards. Consider using fewer or no lights in your holiday decorations. If you must use lights, decorate with more energy efficient LED strings. To make sure they are not over-used, plug your decorative indoor and outdoor lights into a timer to save electricity. This goes for any blow-ups you decide to use on your lawn as well. Choose to decorate using more earth-friendly décor, like pine-needle reefs, a bowl of pine cones, garlands of dried cranberries and popcorn, dried oranges as ornaments, etc. Feel free to get creative and look to utilize natural materials from your yard or with items you already own! If you have any decorations from the years prior, be sure to reuse that and not buy any more. That's what I do every year! On Christmas, a lot of families like to feast on delicious food. Why not buy the ingredients you need from your local farmers market and bulk food stores? Buying locally significantly reduces the carbon footprint of the food (it took a lot less time to get to you resulting in fewer emissions). Also, try to avoid any food packaged in plastic packaging. Aim for foods that are fresh and without any packaging, or lightly packaged in easy to recycle carboard/paper. You can also try your hand at making homemade eggnog and hot chocolate in large quantities to avoid buying them in plastic cartons/packaging. If you're hosting Christmas at your place, be sure to use real utensils and plates to get the job done! Not only do these look better, but they seriously cut back on waste. Plastic cups, cutlery and dishes will all wind up in the landfill where they'll never truly decompose. You use them once and never think of them again...but they'll outlast you and your grandchildren. Pretty creepy thought right? Stick to reusables this time of year. If you're not hosting a family dinner at your place, but going somewhere else, ask the hostess if you can use a reusable cup, plate and utensil set. Offer to wash it yourself at the end of the night. I've done this several times and haven't been refused! At the least, this cuts back on my own waste, even if I can't control everyone else's. Here are more tips on how to stay zero waste at a party that might help. The holidays are definitely full of food, that's for sure. But they're also full of food waste. Did you know 40 percent of the food in the United States in never eaten? But at the same time, one in eight Americans struggles to put food on the table. This sad reality persists even into the holidays. Please reduce your own food waste this holiday season by saving your leftovers (here's how to store leftovers without plastic), or giving them to friends and family. Don't let anything go to waste. Someone can't finish something? Compost it. Have a lot of food scraps left over from cooking? Make it into zero waste vegetable broth. Sending food scraps to landfill only helps generate methane gas, which is more potent than even carbon dioxide. 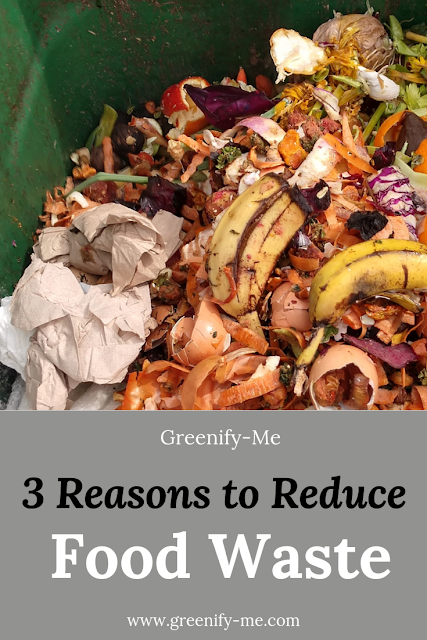 For more ways to reduce food waste, be sure to sign up for my newsletter! 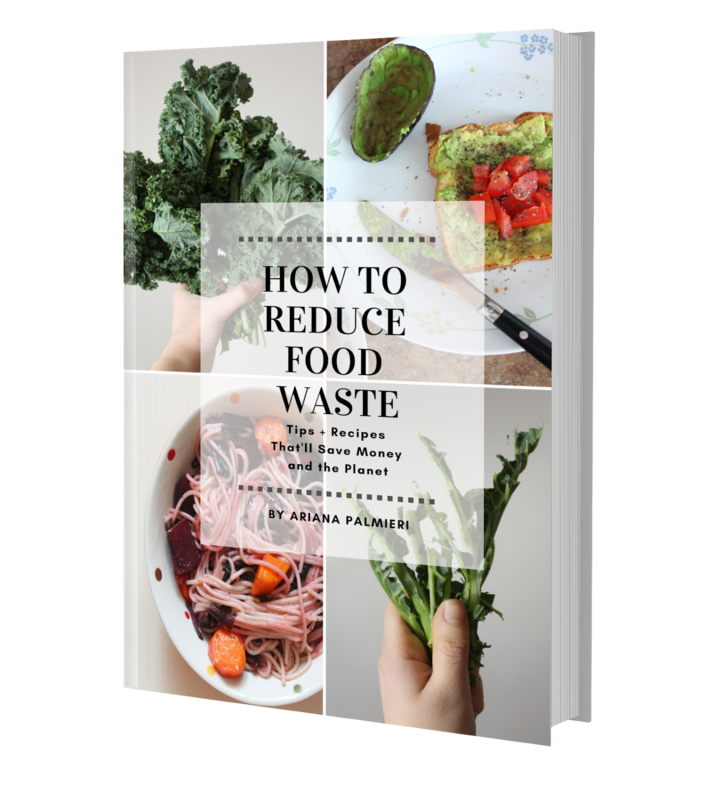 I'll be launching my first for-sale e-book How to Reduce Food Waste: Tips + Recipes That'll Save Money and the Planet soon! You won't want to miss out on updates. It's going to be great. How do you plan on having a zero waste Christmas? Please share this article to help ensure less waste is produced during the holidays. Lets work together to make the holiday season sustainable!